Trek in the cool of the early morning to see prehistoric Tassili rock art. Take a camel trek through endless Saharan desert from the Djanet oasis. Explore intricate natural mazes of Azgel stone caverns. 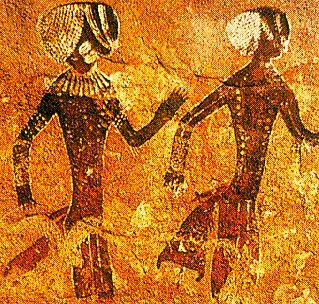 Travel picture of Rock art in the Tassili massif of Central Sahara. Are you doing this tour in 2010? When? What’s the itinerary and cost? Thanks. We’ve just done this tour with a company called Expert Algeria – great fun, very interesting and we’d thoroughly recommend the Tassili. Please email me on the details of your tours to Tassil n Ajjer, Algeria. I want to make a video expedition there in June, leaving from Ohio, USA. What are the prices and arrangements available for me at that time. What concerns do I need to be made aware of such as, the desert heat, amount of unexpected expenses, and possible dangers from local terrorist groups. What ever info you can supply me with will be greatly appreciated. In addition if you can steer me to other links that would help me with my research that to would be apprecitated.